The State elections in Bavaria mark a dramatic shift in German politics. Bavaria’s Christian Social Union (CSU) suffered its worst election result since 1950. It is only the second time since 1962 that they will have to look for a coalition partner. The debate unfolds now how this outcome will resonate in Berlin and beyond and further dent Chancellor Angela Merkel’s position. 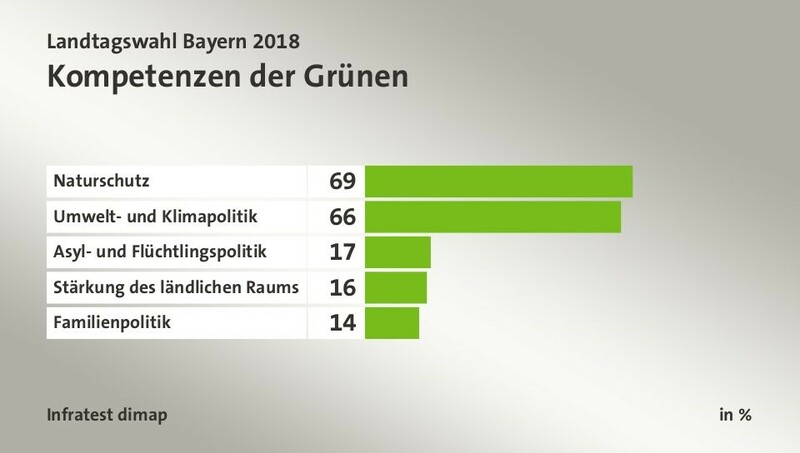 Meanwhile the Greens have become the second-largest political force in Southern Germany. For voters it is obvious what the Green Party wants to achieve. Voters attribute the Greens high competences in their core areas like nature conservation (69 percent), environmental as well as climate policy (66 percent). Voters in Bavaria (and beyond) view these very topics as top priorities. In other words, it’s the ecology, stupid! The Greens benefitted, but also contributed to this by prioritizing environmental issues in their campaign. What comes a bit as a surprise is that voters opted for the Greens primarily because of these programmatic reasons. The party benefitted only partially from their top candidates, whose appearances were widely reported in the run-up to the election, Ludwig Hartmann and Katharina Schulze. For 72 percent of the Green voters the program was the decisive factor - a much higher value in comparison to CSU or SPD. The top candidates were decisive only for 13 percent, whereas the long-term party bond is at eleven percent. Over the last decade, the German Green Party has governed in various constellations across Germany. At peak times, they were part of 11 (out of Germany’s 16 Länder) coalition governments. Throughout this period, they have demonstrated their ability to implement green policies with different partners: with the SPD (its traditional partner), the Left Party, the FDP and even the conservative CDU. Today the Greens govern in nine coalitions across the political spectrum. With this ‘course of independence’ (Kurs der Eigenständigkeit), they have established themselves as a hinge party in Germany’s party system. Despite the different coalitions, voters know what they get. By today the party has created an image of being reliable and stable. That is why, as post-election analysis reveals, the Greens attracted significant voters from both SPD (+230.000) and CSU (190.000). Clearly, the CSU strategy of fishing for right-wing voters backfired. CSU and Greens have enough votes for a majority to form a black-green coalition. Neither has ruled out such a coalition. Constituents would support it. 59 percent of all voters say they would like to see the Greens being part of a government. In addition, even 98 percent of all Green Party voters say so. However, such an alliance would be difficult for two reasons: First, the leading candidates of the Greens have led a tough campaign against Minister President Markus Söder in person and accused him of fueling the EU dispute over the refugee crisis. Second, on a variety of policy issues Greens and CSU fundamentally disagree. The Greens reject the recent police law, anchor centers for refugees and the Bavarian border police, a prestige project by Söder. It is hard to imagine how both leaderships would agree on a compromise, which both parties’ conventions would support. At the time of writing, a black-green coalition looks unlikely, as the CSU prefers an alliance with the more conservative Free Voters. But given the disastrous result for the CSU, some internal party dynamics can be expected to play out over the next days and weeks. The Greens’ clear attitude on refugees is well received by voters across the board. 59 percent, regardless of whether or not they chose green, say: It's good that the Greens are working for a humane asylum policy. Another (astonishing!) 56 percent of respondents say that the Greens defend values that are important to them. That is a new quality of the Greens. They are no longer a scary image, but have arrived in the center. They are a party that wants to preserve not only nature and the environment, but also the achievements of a liberal, democratic, constitutional State. Today, the Greens are the only German party, in which the pro-European, refugee-friendly, liberal-democratic attitude is undisputed. This is their unique selling point. 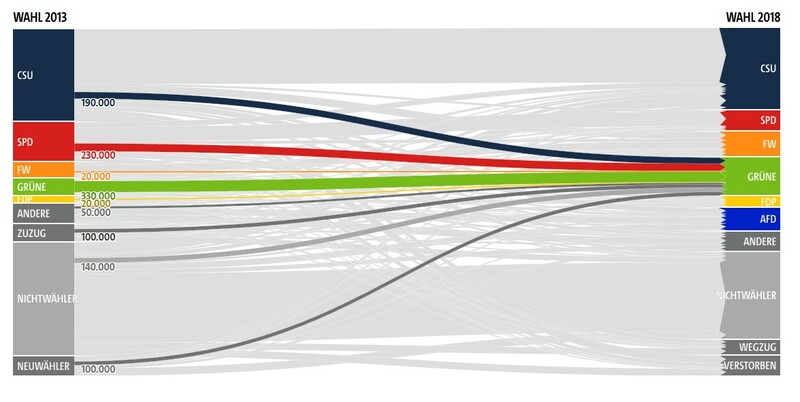 The Green Party ends the CSU dominance in Bavaria. Last night the Greens celebrated a victory that only a year ago few would have thought possible. They have become the liberal antidote to the rightwing AfD. The party’s strategy of promoting a positive, modern and inclusive narrative ‘appears to be working’, reports the New York Times. In the words of ZEIT-editor Bernd Ulrich, the Greens are - as of today - a conservative, state-bearing, moderately left and radical ecological party. My take-away for Europe’s democratic parties is this: Fishing for right-extreme voters doesn’t pay off. If you do so, expect others to take center stage. Voters reward those who stand up for the open, liberal, and democratic society.